The card is based on a few challenges that I want to enter and white on white is one. The color of the cake has to be subtle so I colored washed it with Distressed Inks. My die cuts are Marianne and Magnolia. I love stacking die cuts onto a card. Thank you for leaving sweet thoughts on my card, I love them. How pretty Kelly! I love all the dimension you gave to your cute cake with the nice die cuts behind it! and the cute little tag slipped behind the background. very lovely! Lovely card, Kelly. 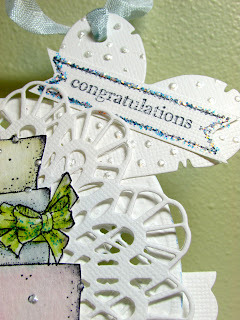 All your die cuts are fabulous and love the light DI color wash. Gorgeous! Quite new at Maggie stamps, and I am in love! Your sweet AND stunning cake is inspiring, thank you! Hi Kelly , what a great wedding-card ! Lovely with that cake. Thank you for joining us at Tilda's Town. Christa. Gorgeous Card! I love all the die cuts. The cake is spectacular. Thanks for joining us at 7 Kids College Fund. Great shape + great die cuts = gorgeouse card. No matter which way I did the math I always get the same answer. Great job Kelly!! Opps if only I get my spelling right. I meant to spell GORGEOUS!!!! 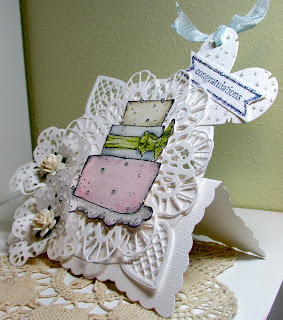 Oh my gosh, what a beautiful way to showcase that Magnolia accessory stamp....looks good enough to eat!!!! Love all the fabulous die cuts and the subtle colors on the cake.....absolutely spectacular, Kelly! This is brilliant Kelly! I like the use of the dies and then the one bit of colour is the cake, which is the focal point. Very pretty! you are a girly girl aren't you sweet Kelly. This is gorgeous and so fancy. Yep - you are a sweet girly girl!! We have stopped for the night in a motel. Will continue on our treck tomorrow. Will try to write you an e-mail from Florida - I am pooped. Best wishes for your challenges. You made a cake that looks too good to eat! Wow! That is gorgeous Kelly. Kelly fantastic card and love all the design details. I love all your elements! Very beautiful design! would like to invite you for a Design team opportunity with Beyond Grey Challenges , we are a card challenge blog and If u want to inspire more people with your stunning creations then please drop by and link 3 of ur best projects. Hi Kelly, your wedding card is so gorgeous! 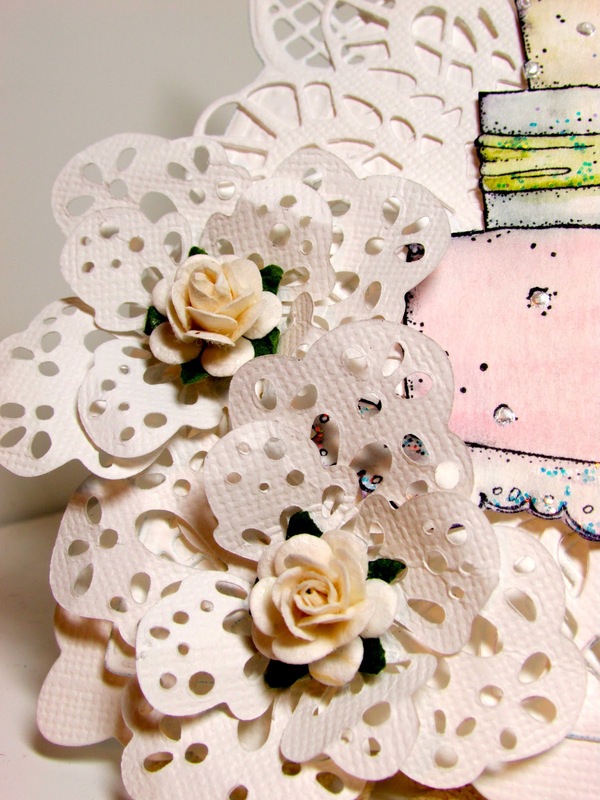 I love all the die cuts that you used along with the beautifully colored Magnolia Cake! Happy New Year! Ooh, I love white-on-white cards, Kelly--one of my faves. Love the soft colours for the wedding cake. Gorgeous doilie diecut. This is just fabulous Kelly, love the white on white and that image is delicious. Loving all those die cuts you've used. Shows you how much lap top knows - I keep getting this post over and over Can't wait to get home so I can make your canvas - I keep dreaming about it!!!!!!! OH WOW!! You never disappoint. LOL!! This looks so delicate and just gorgeous!! Hugs! 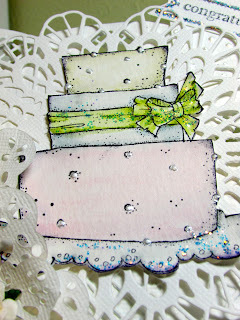 I absolutely love your card Kelly and all the gorgeous dimension and delicate colouring you did on the cake. I think it's great when the Magnolia accessory stamps are used to stand alone and your card is such a perfect example of that. Hope you have a great weekend, hugs, Chris. 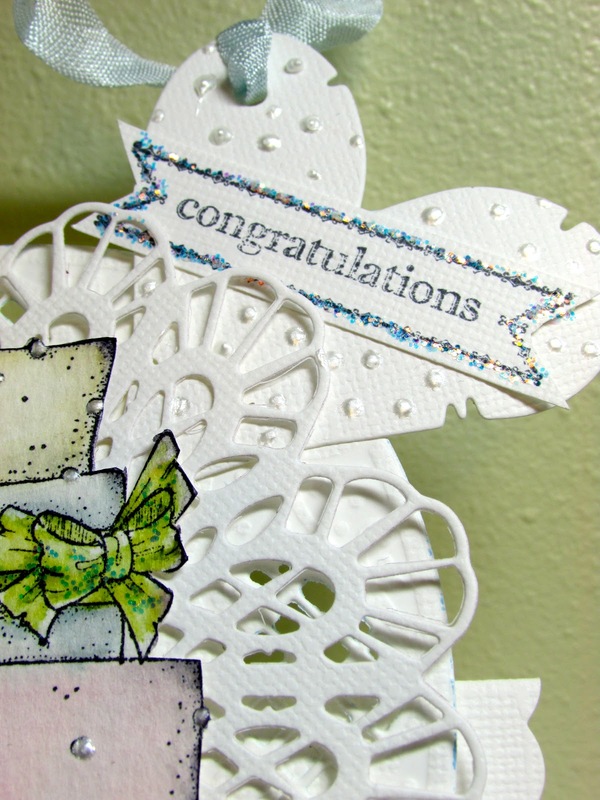 Love all those die-cuts and the image is perfect for the occasion..